The electric carmaker said it agreed to hand over documents to the Department of Justice in connection with CEO Elon Musk's tweets about taking the publicly traded company private last month, according to a company statement. 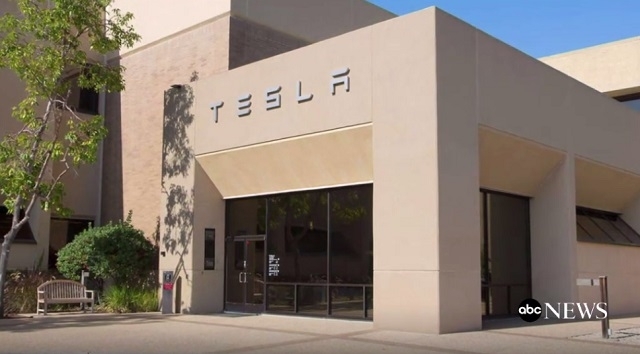 (SAN FRANCISCO) — Tesla shares tumbled on Tuesday amid reports of a potential criminal probe over its chief executive officer’s statements about taking the company private. The electric carmaker said it agreed to hand over documents to the Department of Justice in connection with CEO Elon Musk’s tweets about taking the publicly traded company private last month, according to a company statement. Tesla said it was cooperating with the government, but noted that it had not received a subpoena, a request for testimony or any other formal process. Shares tumbled as much as 7 percent on Tuesday afternoon as investors reacted to the news. The stock closed at $284.89 per share, or about 3.4 percent lower. Tesla issued the statement after Bloomberg reported, citing two anonymous sources with knowledge of the matter, that the DOJ had opened a criminal fraud investigation over Musk’s Aug. 7 tweets. The investigation is in its early stages and could take months, according to the report. The company is also at the center of a Securities and Exchange Commission probe into the firm’s practices and communications, according to Bloomberg. Shares rose as much as 11 percent on Aug. 7 in the wake of Musk’s now-infamous tweet. “Am considering taking Tesla private at $420. Funding secured,” he tweeted. “Investor support is confirmed. Only reason why this is not certain is that it’s contingent on a shareholder vote,” he added in a subsequent tweet, before abandoning the plan. The scope of the DOJ’s investigation is still unclear, but Stephen Crimmins, a former deputy chief of litigation for the SEC, says Musk’s conduct probably doesn’t rise to the criminal level. “It automatically becomes so high profile that the government enforcers have to be particularly conscientious in taking a look at things,” Crimmins told The Associated Press on Tuesday. Crimmins, who spent 14 years at the SEC, said while Musk “speaks loosely,” federal prosecutors would have to prove that he lied in an effort to impact the company’s stock price. That would be difficult to do, he said.